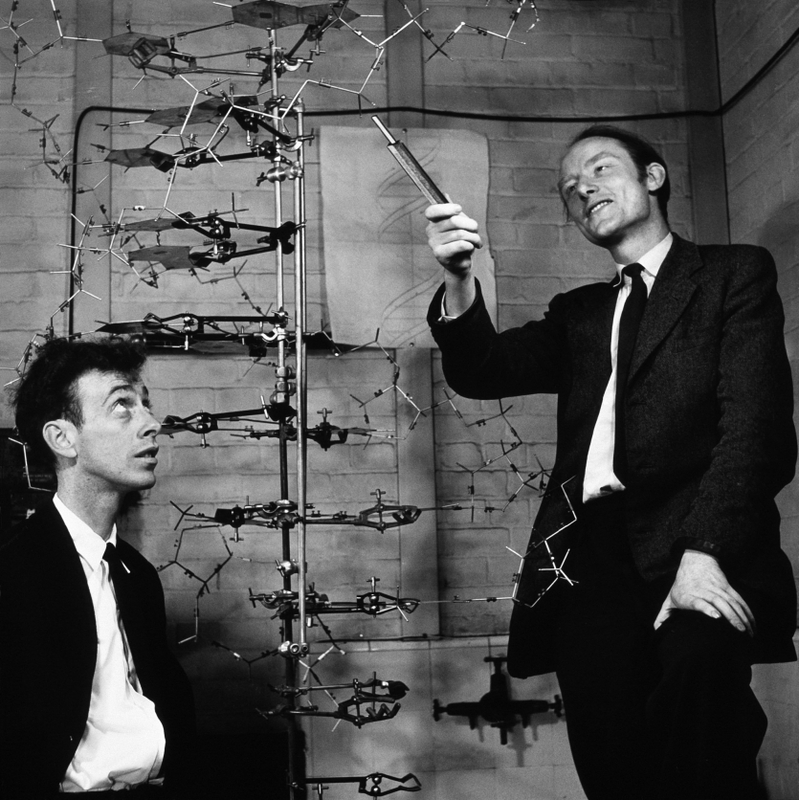 The short paper by James Watson and Francis Crick establishing the helical structure of the DNA molecule was published in the science journal, Nature, on April 25, 1953. The blurb of this book describes it as the scientific breakthrough of the 20th century. Quite probably, although it was a busy century – the discovery of antibiotics was quite important, too, not to mention the atom bomb. Anyway, what makes this first-person account of the events leading up to the discovery such fun is Watson’s prose style and mentality. He is fearless. He takes no prisoners. He is brutally honest about his own shortcomings and everyone else’s and, in doing so, sheds extraordinarily candid light on how science is actually done. He tells us that foreign conferences where nobody speaks English are often pointless. Many scientists are just plain stupid. Some colleagues are useless, some make vital contributions at just the right moment. Watson has no hesitation in telling us that, when he arrived in Cambridge in 1951, aged just 23, he was unqualified in almost every way – although he had a degree from the University of Chicago, he had done his best to avoid learning any physics or chemistry, and as a graduate student at Indiana he had also avoided learning any chemistry. In fact the book keeps referring to his astonishing ignorance of almost all the key aspects of the field he was meant to be studying. The one thing he did have was a determination to solve the problem which had been becoming ever-more prominent in the world of biology, what is a gene? Watson says he was inspired by Erwin Schrödinger’s 1946 book, What Is Life? which pointed out that ‘genes’ were the key component of living cells and that, to understand what life is, we must understand what genes are and how they work. The bacteriologist O.T. Avery had already shown that hereditary traits were passed from one bacterium to another by purified DNA molecules, so this much was common knowledge in the scientific community. DNA was probably the agent of hereditary traits, but what did it look like and how did it work? A situation compounded when Herman began to undergo a painful divorce and his mind wandered from his work altogether. It was a chance encounter at a conference in Naples that motivated Watson to seek out the conducive-sounding environment of Cambridge (despite the reluctance of his funding authorities back in the States to let him go so easily). John Kendrew, the British biochemist and crystallographer, at that point studying the structure of myoglobin, helped smooth his passage to the fens. I have never seen Francis Crick in a modest mood. he talked louder and faster than anybody else, and when he laughed, his location within the Cavendish was obvious. So he had found a home of sorts and, in Francis Crick, a motormouth accomplice who was also obsessed by DNA – but there were two problems. The powers that be didn’t like Crick, who was constantly getting into trouble and nearly got thrown out when he accused the head of the lab, Bragg, of stealing one of his ideas in a research paper. Most of the work on the crystallography of DNA was being done at King’s College, London, where Maurice Wilkins had patiently been acquiring X-rays of the molecule for nearly ten years. There was a sub-problem here which was that Wilkins was being forced to work alongside Rosalind Franklin, an expert in X-ray crystallography, who was an independent-minded 31-year-old woman (b.1920) and under the impression that she had been invited in to lead the NA project. The very young Watson and the not-very-securely-based Crick both felt daunted at having to ask to borrow and interpret Wilkins’s material, not least because he himself would have to extract it from the sometimes obstreperous Franklin. And in fact there was a third big problem, which was that Linus Pauling, probably the world’s leading chemist and based at Cal Tech in the States, was himself becoming interested in the structure of DNA and the possibility that it was the basis of the much-vaunted hereditary material. Pauling’s twinkling eyes and dramatic flair when making presentations is vividly described (pp.37-8). Along the same lines, Watson later gives a deliberately comical account of how he is scoffed and ignored by the eminent biochemist Erwin Chargaff after making some (typically) elementary mistakes in basic chemical bonding. In a typical anecdote, after attending a lecture in London given by Franklin about her work, Watson goes for a Chinese meal in Soho with Maurice Wilkins who is worried that he made a mistake moving into biology, compared to the exciting and well-funded world of physics. The physics of the time was dominated by the aftershock of the massive wartime atom bomb project, and with ongoing work to develop both the H-bomb and peacetime projects for nuclear power. It’s in this respect – the insights into the way the lives of scientists are as plagued by uncertainty, professional rivalry, and doubts about whether they’re in the right job, or researching the right subject, gnawing envy of more glamorous, better-funded labs and so on – that the book bursts with insight and human interest. By about page 50 Watson has painted vivid thumbnail portraits of all the players involved in the story, the state of contemporary scientific knowledge, and the way different groups or individuals (Wilkins, Franklin, Pauling, Crick and various crystallographer associates at the Cavendish) are all throwing around ideas and speculations about the structure of DNA, on bus trips, in their freezing cold digs, or over gooseberry pie at their local pub, the Eagle in Cambridge (p.75). For the outsider, I think the real revelation is learning how very small the final achievement of Crick and Watson seems. Avery had shown that DNA was the molecule of heredity. Chergaff had shown it contained equal parts of the four bases. 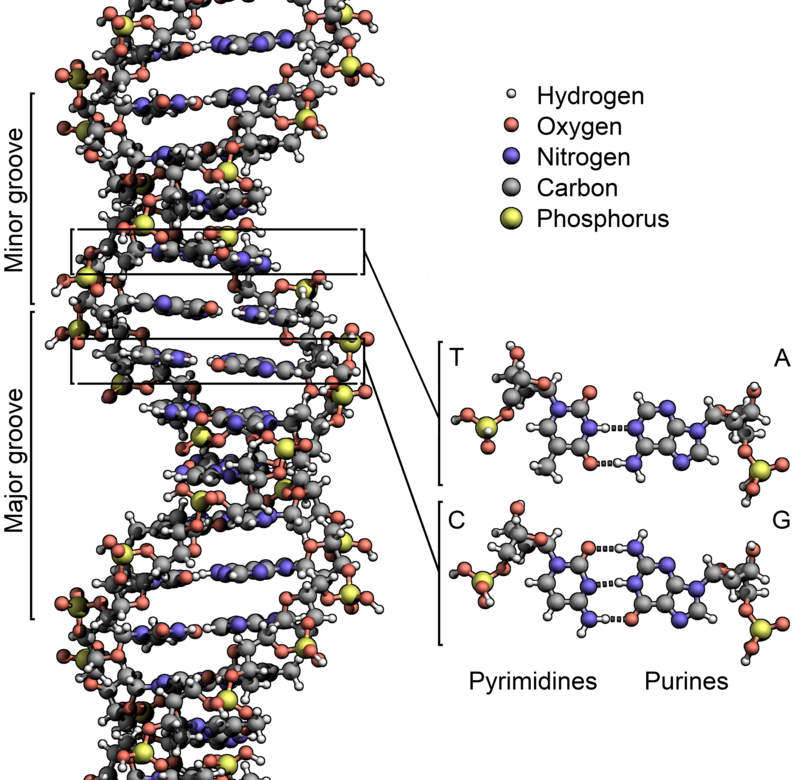 Wilkins and Franklin had produced X-ray photos which strongly hinted at the structure and the famous photo 51 from their lab put it almost beyond doubt that DNA had a helix structure. Pauling, in America, had worked out the helical structure of other long proteins and had now began to speculate about DNA (although Watson conveys his and Crick’s immense relief that Pauling’s paper on the subject, published in early 1953, betrayed some surprisingly elementary mistakes in its chemistry.) But the clock was definitely ticking very loudly, rivals were closing in on the answer, and the pages leading up to the breakthrough are genuinely gripping. In other words, the final deduction of the double helix structure doesn’t come out of the blue; the precise opposite; from Watson’s account it seems like it would have only been a matter of time before one or other of these groups had stumbled across the correct structure. But it is very exciting when Watson comes into work one day, clears all the clutter from his desk and starts playing around with pretty basic cardboard cutouts of the four molecules which, by now, had become strongly associated with DNA, adenine and guanine, cytosine and thymine. Suddenly, in a flash, he sees how they assemble the molecules naturally arrange themselves into pairs linked by hydrogen bonds – adenine with thymine and cytosine with guanine. For a long time they’d been thinking the helix had one strand at the core and that the bases stuck out from it, like quills on a porcupine. Now, in a flash, Watson realises that the the base pairs, which join together so naturally, form a kind of zip, and the bands of sugar-phosphates holding the thing together run along the outside – creating a double helix shape. By elucidating the structure of DNA, the molecule underlying all life, Francis Crick and James Watson revolutionised biochemistry. At the time, Watson was only 24. His uncompromisingly honest account of those heady days lifts the lid on the real world of great scientists, with their very human faults and foibles, their petty rivalries and driving ambition. Above all, he captures the extraordinary excitement of their desperate efforts to beat their rivals at King’s College to the solution to one of the great enigmas of the life sciences. The science is interesting, but has been overtaken and superseded generations ago. It’s the characters and the atmosphere of the time (the dingy English rooms with no heating, the appalling English food), the dramatic reality of scientific competition, and then the genuinely exciting pages leading up to the breakthrough which makes Watson’s book such a readable classic. I marked all the places in the text where a feminist might explode with anger. Both Watson, but even more Crick, assume pretty young girls are made for their entertainment. They are referred to throughout as ‘popsies’ and Crick in particular, although married, betrays an endless interest in the pretty little secretaries and au pairs which adorn Cambridge parties. It is through this patronising and sexist prism that the pair judged the efforts of Franklin who was, reasonably enough, a hard-working scientist not at all interested in her appearance or inclined to conform to gender stereotypes of the day. She felt marginalised and bullied at the King’s College lab, and irritated by the ignorance and superficiality of most of Watson and Crick’s ideas, untainted as they were by any genuine understanding of the difficult art of X-ray crystallography – an ignorance which Watson, to his credit, openly admits. Eventually, Franklin found working with Wilkins so intolerable that she left to take up a position at Birkbeck College and then, tragically, discovered she had incurable cancer, although she worked right up to her death in April 1958. Franklin has become a feminist heroine, a classic example of a woman struggling to make it in a man’s world, patronised by everyone around her. But if you forget her gender and just think of her as the scientist called Franklin, it is still a story of misunderstandings and poisonous professional relations such as I’ve encountered in numerous workplaces. Watson and Crick’s patronising tone must have exacerbated the situation, but the fundamental problem was that she was given clear written instructions that she would be in charge of the X-ray crystallography at King’s College but then discovered that Wilkins thought he had full control of the project. This was a management screw-up more than anything else. It does seem unfair that she wasn’t cited in the Nobel Prize which was awarded to Crick, Watson and Wilkins in 1962, but then she had died in 1958, and the Swedish Academy had a simple rule of not awarding the prize to dead people. Impressive list, don’t you think? And anyone who hasn’t read the book might be easily persuaded that she was an unjustly victimised, patronised and ignored figure. But just to set the record straight, Watson chooses to end the entire book not with swank about his and Crick’s later careers, but with a tribute to Franklin’s character and scientific achievement. In 1958, Rosalind Franklin died at the early age of thirty-seven. Since my initial impressions of her, both scientific and personal (as recorded in the early pages of this book), were often wrong, I want to say something here about her achievements. The X-ray work she did at King’s is increasingly regarded as superb. The sorting out of the A and B forms [of DNA], by itself, would have made her reputation; even better was her 1952 demonstration, using Patterson superposition methods, that the phosphate groups must be on the outside of the DNA molecule. Later, when she moved to Bernal’s lab, she took up work on tobacco mosaic virus and quickly extended our qualitative ideas about helical construction into a precise quantitative picture, definitely establishing the essential helical parameters and locating the ribonucleic chain halfway out from the central axis. That is a fine, generous and moving tribute, don’t you think? And as candid and honest as the rest of the book in admitting his and Crick’s complete misreading of her situation and character. In a literal sense the entire book leads up to this final page [these are the last words of the book] and this book became a surprise bestseller and the standard source to begin understanding the events surrounding the discovery. So it’s hard to claim that her achievement was suppressed or ignored when this is the climax of the best-selling account of the story.